The audience was mostly comprised of people from the public and private sectors and the presentation was geared towards answering their questions. Although I didn’t hear any representatives from the startup community, I assume that there were some present. I wonder how they would have responded to Langshur’s question. Would a founder of a brand new company whose name is virtually unknown and whose website is not yet entirely trusted by search engines consider Google their home page? Today, every business that has a website, from a multi-billion dollar conglomerate to a tiny one-person startup, is reliant on SEO to get noticed because Google has become the dominant navigation tool on the Internet. However, SEO for startups is very different than it is for a business giant due to budget constraints and low domain trust, because Google’s algorithms trust older domains that have lots of older links and are suspicious of newer sites. In order for you, the entrepreneur, to develop a trusted website for your startup that ranks highly on search engines, you must set goals, create great content and use search terms wisely. With a bit of creativity and effort, you can effectively lead masses of people to you site through organic search results and save hundreds of thousands of dollars you could otherwise have spent on advertising or an SEO consultant. Setting goals or benchmarks well before the launch of your site is vital to determine your success. Ask yourself, what do you want to get out of SEO? Sales, users, awareness and engagement are common goals among startups, but how will you know if you have achieved them? In the digital world, everything can be and should be measured. There are many online analytics tools that can help with this process. For example, Google Analytics provides free enterprise-class tools that allow you to set goals and measure key indicators to determine if goals have been reached. The number of visitors to your site is not a sufficient objective on its own, said Langshur. Comparing the number of visitors with the average time on site within a specific time frame will give you a better idea of the level of engagement. Good content that naturally attracts links and is keyword rich is king for SEO. However, if your goal is to get users or sales, you have to balance SEO with user conversion. Conversion-oriented pages don’t attract links that frequently as their content is usually sales focused. A balance of SEO-friendly content that is keyword rich with sales-focused content is not enough to boost search engine ranking. Links must also be established between other websites to tell Google’s algorithms that your site is trusted and useful. Older domains have an advantage on search terms that gets stronger with each passing day. Cornell University released data that revealed that Google’s first search hit receives 56.36 percent of clicks whereas its second hit receives only 13.45 percent. To beat out older domains, focus on long-tail search terms that are most specific to you. If you provide a smartphone application that helps people find specific food items at a grocery store, use search terms like “grocery store smartphone application” that represent your niche. Also worth noting is that conversion rates for head terms are terrible. Head terms are short and popular search terms that are typically used at the beginning of someone’s research into a more specific topic. Longer, specific queries are more common among people who have done research and are closer to making a purchasing decision. Creating unique, intriguing and engaging content is a great way to rank highly on search engines. This can be done by allowing user-generated content or hiring a skilled team of ghostwriters. However, for startups, these methods can be impractical. Although user-generated content worked famously for sites like YouTube, it is a risky undertaking that can potentially lead to masses of useless content on your site. Ghostwriters can also be too expensive for a startup budget. Creating a blog for your startup website and sharing its content on social media can be a very effective strategy. However, it is important to keep in mind that while social media platforms are free, engaging on them for the long-term can become time-consuming and expensive. It is imperative that a social media strategy be laid out beforehand to ensure enough resources are available to invest in a long-term commitment to blogging and social media. Make sure your content is enduring, unique, compelling, easily consumable and easily sharable. Building out relationships with other bloggers who write about your stuff is a great way to get your content linked to and/or replayed. 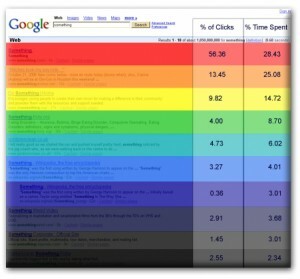 How are you optimizing your content for search engines? Are there any additional key tips that I missed? I’d love to hear your thoughts. I missed you at this event but when I got there everyone was sitting down already. I am living this stuff in the trenches day to day and for startups, this stuff is hard because you most likely have competition that has been out there optimizing on this stuff for ages… and it takes time to build rankings… so do it, but be aware of that. Like you say, goals and tracking goals are KEY. They are especially important in relation to SEO because you might find a bunch of keywords that don’t lead to the fulfillment of your goals. I saw you across the room but the presentation had already started. Indeed, it is hard for startups to compete with long-established domains. However, it is absolutely imperative for them to get started early. As you say, it takes time to build a ranking. So, the earlier they get started, the better. Indeed, some keywords may not work as well as planned. As someone entrenched in this world every day, do you suggest that startups employ a “trial and error” approach to keywords or is there a better method for selection?